DEC recently announced that it would reduce 2019 Chinook salmon stocking in Lake Ontario by an additional 20 percent to help ensure the long-term sustainability of the high-quality Chinook salmon fishery. Chinook salmon in Lake Ontario feed almost exclusively on large alewife, and the severe winters of 2013 and 2014 resulted in poor alewife survival creating instability in the adult alewife population. Chinook salmon and lake trout stocking reductions in 2017 and 2018 (20 percent each) were implemented to help avoid a future imbalance between stocked and wild trout and salmon and the alewife forage base. DEC recently held public meetings in Niagara, Monroe and Oswego counties to present information on the status of the alewife population in 2018, and to discuss 2019 stocking levels. 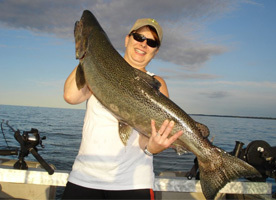 DEC remains optimistic that the excellent fishing in Lake Ontario will continue in 2019. Additional details concerning the stocking cuts and DEC’s effort to manage the Lake Ontario fishery can be found on DEC’s website.